By playing both basketball and soccer for Ryerson, Ashley Keohan is a Ram in more ways than one. After two years of shooting hoops, Ashley Keohan has decided she needs more than just playing basketball to get her kicks. Keohan, a veteran on the women’s basketball team, is a rookie on the women’s soccer team this year. Women’s soccer head coach Jon Sanderson says he only wishes Keohan had started spreading her love earlier. After switching over from midfielder to sweeper last week, Keohan has become one of the Rams most dominant defensive players. Sanderson hopes Keohan’s attitude will eventually wear off on her soccer teammates, while women’s basketball head coach Sandy Pothier hopes Keohan doesn’t wear down before she takes the court with her basketball teammates. So far Keohan’s soccer and basketball schedules conflict twice a week. There is a major overlap during the soccer playoff weekend, but with a 0-5 start, the Rams are nearly kicked out of the playoff hunt. Although this is the first time Keohan has gone the dual sport root at Ryerson, this is the second time she’s done it as a Ram. Keohan played soccer, basketball and volleyball throughout high school with the St. Francis Xavier Rams in Edmonton. Only time will tell if Keohan will be able to fit two varsity teams into her academic schedule during this go around. Keohan’s grades might not be the only thing that could be taking a beating this year. “Soccer is keeping me in shape, but it’s taking a toll on my body,” says Keohan. Keohan says conditioning workout for basketball hurt enough, and playing full soccer games on the weekends isn’t exactly nursing her wounds. Pothier says she often worries about the possibility of Keohan’s 5-foot-6 frame getting injured, especially since she is one of the basketball team’s leading scorers. 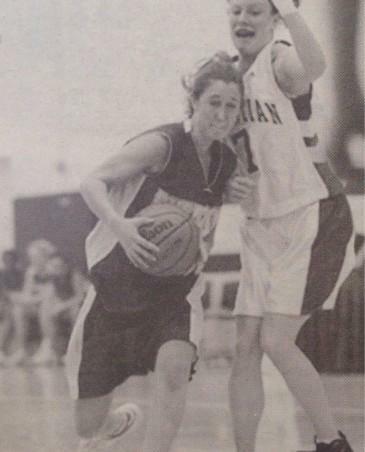 Keohan’s 15 point performance during the Rams upset of Laurentian University in the 2001-2002 playoffs elevated Ryerson into the Ontario University athletics championship game for the first time in school history. “We had a great season last year,” says Keohan, ranking the upset over the Voyageurs as the highlight of her multi-sport career. Although Pothier would prefer to see Keohan concentrate solely on basketball, she understands the desire to compete in both sports.